Rob and I spent the majority of the weekend watching The Great British Bake Off on Netflix. This inevitably put me in the mood to bake! These Crunchy Almond Butter Cookies require about 10 minutes of prep and 15-20 minutes in the oven. Which means you can prep them during a quick break between episodes, place them in the oven, and press play. They’ll be ready by the technical challenge! They are absolutely scrumptious (and vegan and gluten free), but I’ll let you be the judge! All ingredients can be found zero waste from the bulk section of supermarkets. And I made my own almond butter using my favorite machine- the NutraMilk. I can’t wait for you to try! Make the chia egg by combining the chia seeds with water in a bowl. Let sit. Grind up the almonds into a flour using a food processor or a blender to make ground almonds. I like to leave some chunks of almonds as opposed to making a fine flour. NOTE: The next time you need almond (or oat) flour, remember this trick. You can make these flours zero waste. Simply grind/blend/process bulk nuts, seeds, grains ingredients! Combine the ground almonds, brown rice flour, maple syrup, melted coconut oil, cinnamon and baking powder into a bowl. Mix together and then add in the chia egg. Mix again. Coat a baking sheet with a thin layer of coconut oil or avocado oil. Roll about a tablespoon of the mixture into a ball and place it on the baking sheet. Press down to make a round cookie shape. Repeat for the rest of the batter and space the cookies evenly. Bake in the oven for about 15-20 minutes at 350F. Let cool for 10 minutes. 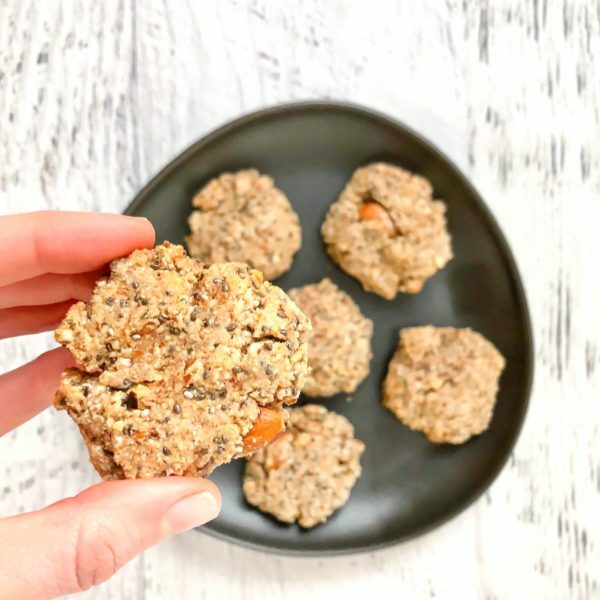 Take in the amazing aroma in your kitchen and enjoy these nutrient dense, zero waste cookies!